Makes Kermit look like Einstein ! I knew a guy who, for the life of him; could not turn 'left' or 'right' while we were driving in the USA. Because he was driving in the LEFT seat, he also transposed left and right. You'd say Colin, take the next left and he'd turn right. So as we had Colin (driving) and Jim (passenger seat) we'd say, Colin, take the next 'Jim' and he was fine! The lady above however, needs remedial class. I happened to be scanning the TV yesterday and I caught just the last half of this video on the news. It was pretty funny. I thought she had just moved it twice before figuring out the correct way to park, not FOUR times. Oh my, this goes from funny to hilarious! The lady is extremely spatial orientationally challenged. Or has been smoking too much non-tobacco product. Actually quite scarey that we have to share the roads with people like this! 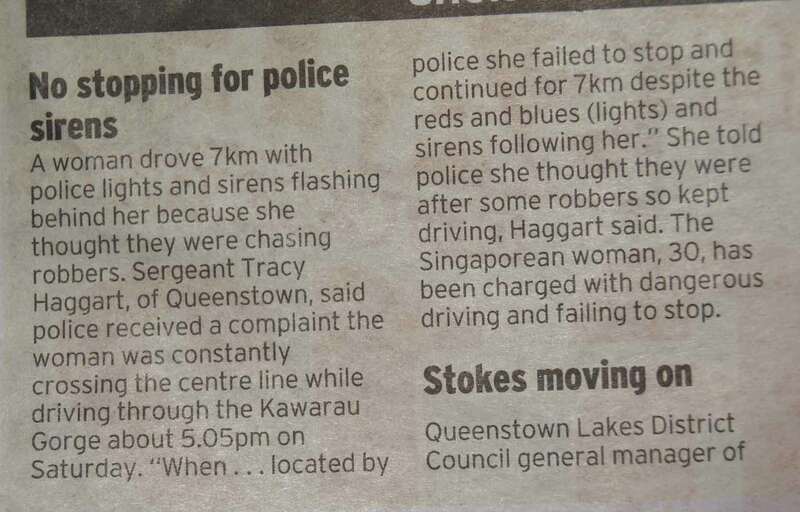 This was in the local paper a couple of days ago. I shake my head in dismay and fear for my life that I have to share the road with tourist drivers like this. Last edited by kiwi TK; 01-03-2015 at 06:08 AM. My F4i progress! All comments welcome! MY CBR F3-Need your comments, Please! Petition for LANE SHARING on Motorcycles.